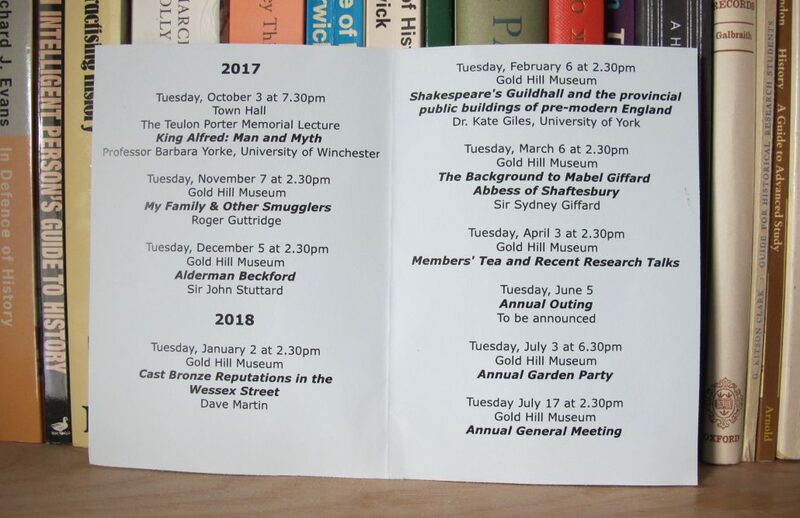 Contributors to the 2017-18 programme of Shaftesbury & District Historical Society lectures include a popular local history writer, a former Lord Mayor of London, an Ambassador to Japan, two leading academics, and a student of statues. The historical subjects covered include Dorset Smugglers, William Beckford Senior, Statues within 50 miles of Shaftesbury, Shakespeare’s Guildhall, and a 13th century Abbess of Shaftesbury. Professor Barbara Yorke of the University of Winchester starts the season at Shaftesbury Town Hall at 7.30p.m. on Tuesday 03 October with an assessment of King Alfred: Man and Myth. Lectures are free to S&DHS members while non-members may pay at the door.